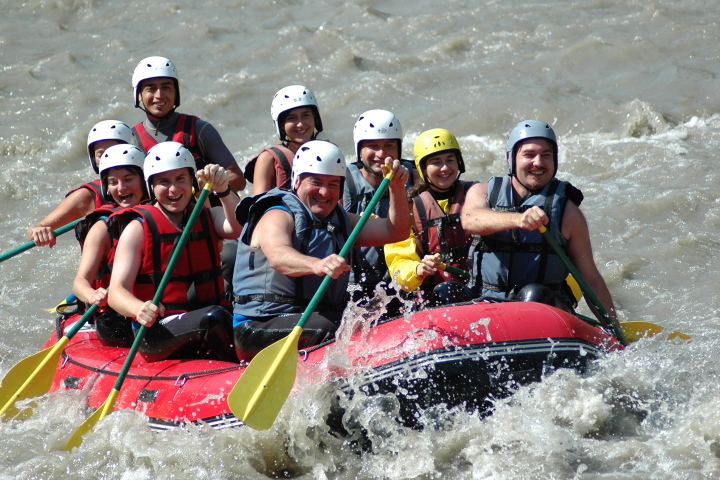 The Pyrenees chain is a mecca for the riversport adventure enthusiast. 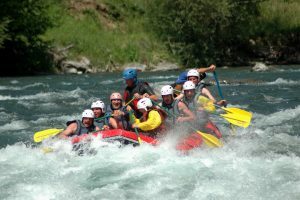 On this riversports adventure holiday we’ve teamed up with the best local experts in France and Spain to create a unique and adrenalin-fuelled experience for the watersports enthusiast. Note all these activities are also available on our summer multi activity holiday. 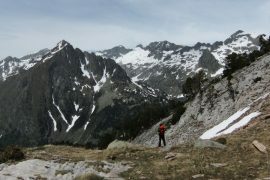 The rivers that flow down from the high mountains in the springtime are supercharged with snowmelt. 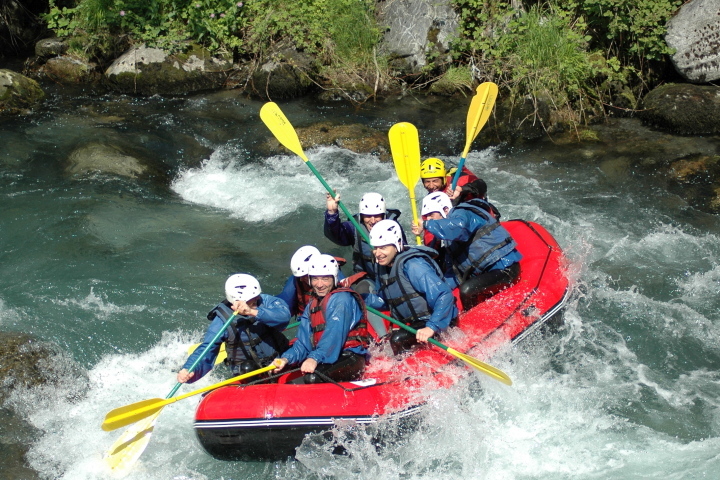 This riversports adventure holiday gives you the opportunity to experience not only some of the best canyoning in the Pyrenees but riverboarding and river rafting too. Hold on tight and enjoy the ride! 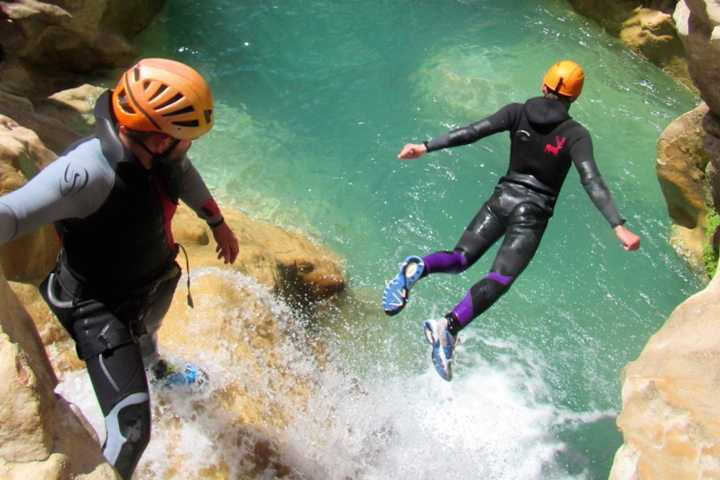 The canyoning in the Pyrenees has many faces and provides a multitude of experiences. You’ll discover the wilder side of canyoning on the French side with the descent of a canyon that carries water down from some of the highest peaks in the Pyrenees. 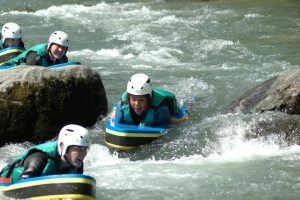 It’s an out there environment and an exciting river with plenty of abseiling, jump offs and slides into deep water pools. Riverboarding or hydrospeed as it is known in France, is a springtime riversport reserved for the strong, experienced swimmer or those with previous riverboarding experience. 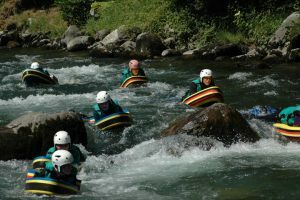 Laying face down with flippers on your feet, you use your feet and bodyweight to steer and control the board through the turbulent current of the snowmelt swollen river. 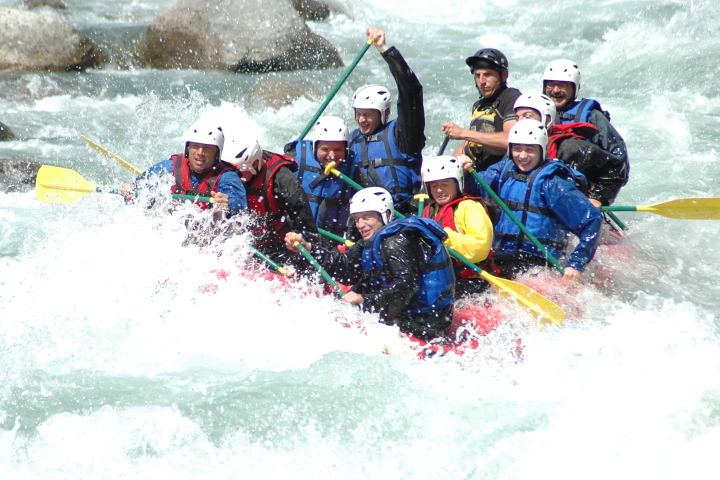 It’s an unforgettable, adrenaline fuelled trip. The river rafting experience takes place on the mighty Garonne river which flows down from the highest mountains of the Pyrenees. 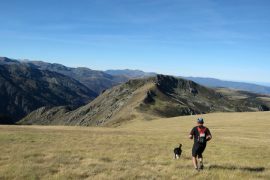 The start point is on the river up the Aran Valley in Spain and you will descend down to the border with France. Is this riversports adventure holiday for me? The answer is ‘Yes’ if you are a strong, capable swimmer with a head for adventure. 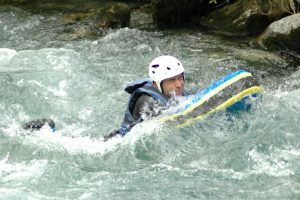 You don’t need to have previous canyoning experience as you will be taught the necessary ropework by your instructor. 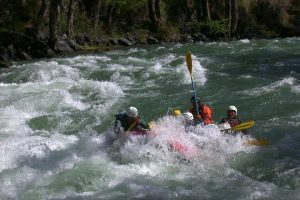 Note that for safety reasons, the availability of canyoning in early April will be dependent on river conditions. 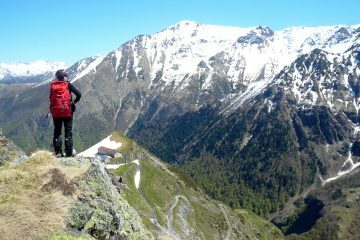 You’ll be collected from Toulouse airport and make the 1h30 transfer to your base in Bagneres-de-Luchon, a lovely spa town at the foot of some of the highest peaks in the Pyrenees. 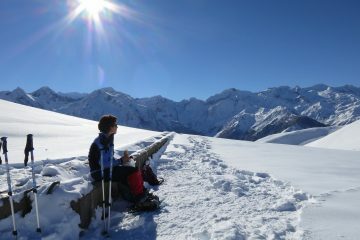 After breakfast you’ll be transferred up the road to the Oô valley which nestles at the foot of some of the highest peaks of the Pyrenees Here, you’ll meet your guide Patrice. After a safety briefing and kit sorting out, you’ll don your wetsuits and walk 30 mins up to the starting point of the canyon descent. Then let the fun begin! 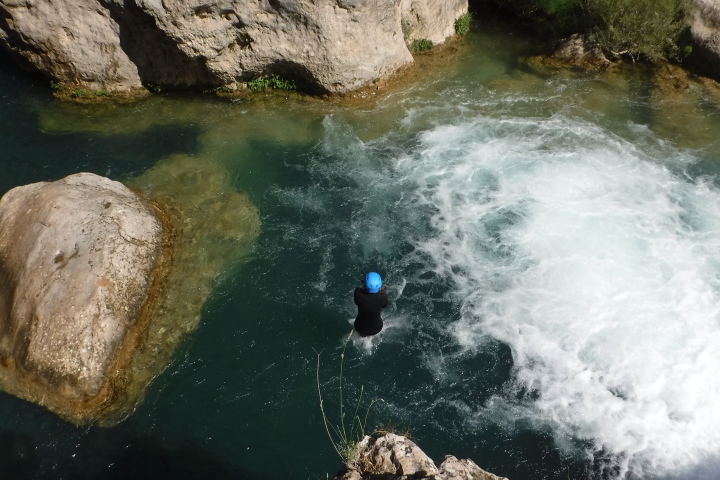 Your guide will drive you in the minibus to your canyoning base in the Sierra de Guara. You’ll spend today and tomorrow enjoying the spectacular canyons of the Rodellar and Miramar areas where there are canyon descents for all abilities. Your accommodation for the night is an apartment on a complex that includes an excellent restaurant serving home-cooked meals. This is also where you’ll take breakfast. Budget on around 25€ pp for dinner and breakfast. 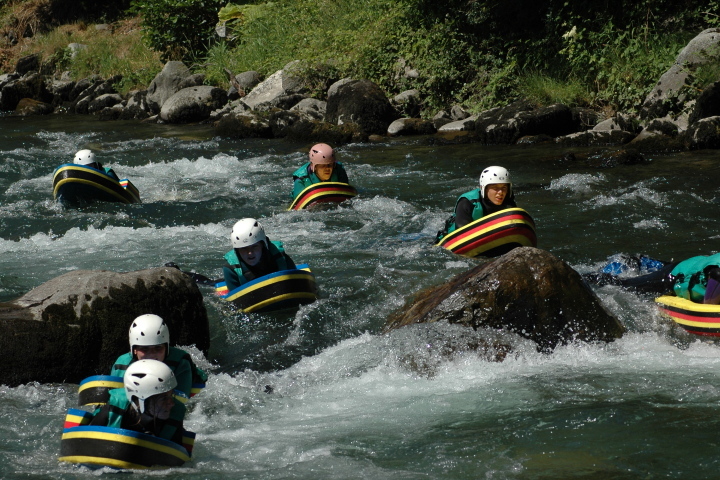 After your canyoning fun on day 3 you’ll be transferred back to Luchon for a rest day in the town. You may wish to discover the Vaporarium, the largest natural hammam in Europe. 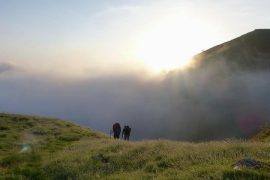 Or maybe a local hike may be more your thing. Either way, we’ll give you some options. 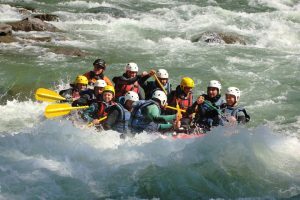 More river fun today as you are taken to the river base for a river rafting descent of the River Garonne. 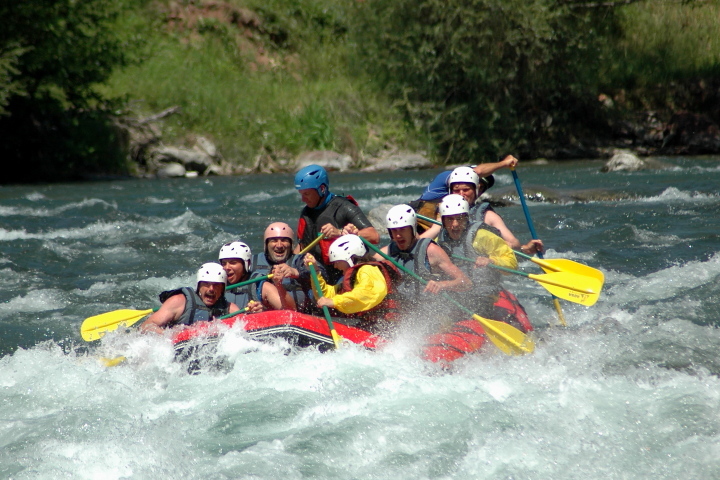 The Garonne river has its source up amongst the highest peaks of the Pyrenees. The snowmelt in spring supercharges the river which makes for an action-packed descent. Hold on tight and enjoy the ride! 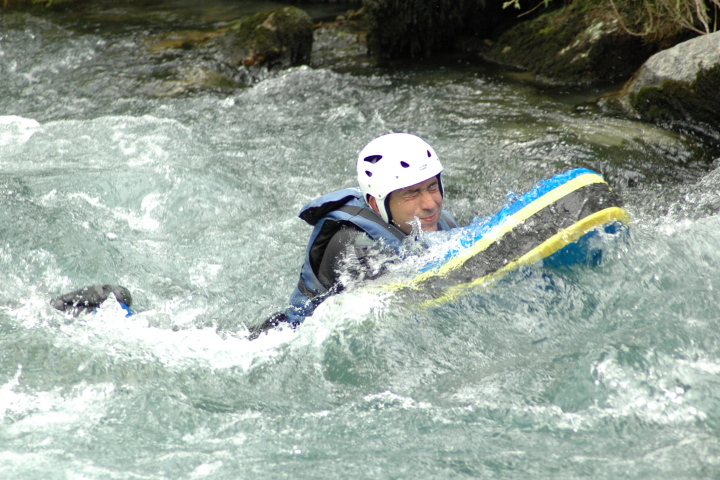 Riverboarding is on the itinerary today, a sport which in the springtime is purely the reserve of the strong swimmer. After an action-packed week of watersports you’ll be transferred back to Toulouse for your flight home.